Feb. 29, 2016 | Harrisburg, Pa.
Harrisburg, Pa. (Feb. 29, 2016)  Secretary of Education Pedro A. Rivera today announced a partnership with the Highmark Foundation and the Center for Health Promotion and Disease Prevention to operate the Department of Education's Bullying Prevention Consultation helpline. The helpline serves as a resource to Pennsylvania students, families, and schools to help them develop strategies to address bullying and resolve bullying situations. "Students learn and focus most effectively when they feel safe and cared for," Rivera said during a visit to Harrisburg School District's Marshall Math Science Academy. 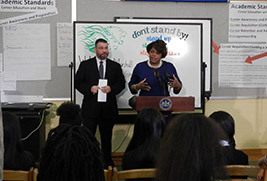 "Schools across the country are looking at ways to prevent bullying and its harmful impacts, and this partnership is one of the initiatives Pennsylvania has put in place to support our students, schools, and families and help our children achieve." The Highmark Foundation has provided $30,000 to help operate the line, as well as create posters and resources for schools in Pennsylvania to post in their buildings informing students, teachers, and staff that the consultation line is available. The line is available to students, parents/guardians, and schools, both public and nonpublic. "Bullying is a major public health issue. It is a malicious, pervasive behavior that has emotional and physical effects on its victims, ultimately hindering learning and a positive school experience for thousands of children," said Highmark Foundation President Yvonne Cook. "The Highmark Foundation supports initiatives and programs aimed at improving community health. This grant is an example of how we do just that by working with partners like the Pennsylvania Department of Education and the Center for Health Promotion and Disease Prevention to address issues affecting the well-being of those in our communities." "In my work as a school-based Outpatient Therapist I saw the impact that bullying had on students on a daily basis," CHPDP's Karla Good added. "Providing support and resources to these students became a large part of my job. With the development of the Bullying Prevention Consultation line we are now able to offer support on a much larger basis to students, families, schools and communities at large. This is an important and much needed service, as all students deserve to go to school and feel safe."